Panasonic TX-P50GT30 review | What Hi-Fi? Comparing the spec sheet of this £1300 TX-P50GT30 with the £1700 Panasonic TX-P50VT30 is like a tough game of spot-the-difference. Panasonic has helped us out, though, confirming that, aside from differences in looks and construction, the GT’s High Contrast Filter lacks the VT’s ‘Pro’ suffix. It also doesn’t have the VT’s ultra-advanced ISF calibration option, has a more basic speaker arrangement and can’t record to SD card (though it can still record to USB). Other differences are in what you get (or not) in the box. Although both sets are 3D and wi-fi ‘ready’, you don’t get 3D glasses or a wireless dongle with the GT30. Still, adding two pairs of specs and the Netgear adapter shouldn’t set you back more than £250, which would keep the GT30’s total price under that of the VT - the difference in cost could buy you a 3D Blu-ray player. Only the VT’s lovely, backlit remote can’t be bought separately, but given that saving we’ll happily make do with the last-gen wand. So, what do you lose in performance? 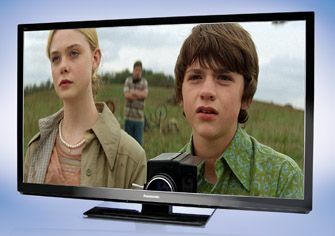 Put them side by side and although there are some differences in the preset picture modes, once calibrated the two pictures are near identical – as a spin of part one of Harry Potter and the Deathly Hallows showed. If pushed, we’d say that the GT30 has a hint of extra red in its palette, but other than that the performance is closely matched. There’s oodles of detail in faces, clothes and even the darkest corners of the eerie settings, and edges are lovely and sharp and extremely solid – even during fast motion, which is clean and controlled without seeming cut-out or unnatural. If you buy the 3D glasses you’ll notice that they might not be too comfy on the nose, but that the 3D performance is very easy on the eyes. We’d turn the C.A.T.S. mode off to get the most punch: you’ll get a bright and dynamic picture with sharp edges, no visible crosstalk and just a bit of motion blurring (which all sets struggle with in 3D). DVDs and standard-definition TV shows are upscaled extremely well here, with even a nasty broadcast like Dave looking really clean, vibrant and controlled. Unsurprisingly, high-definition shows look gorgeous from both the Freesat and Freeview tuners, and the Viera Connect web portal’s inclusion of the likes of BBC iPlayer, Acetrax, Twitter, Facebook and Skype means you’ll never run out of things to watch or ways to get social. The only problem is the sound, which is weak next to not only the VT30, but also most of its rivals. If that’s a key concern for you, it might be worth stretching for the more premium Panasonic TX-P50VT30, but considering the price gap, the GT30 seems the better performance-per-pound proposition.